So this is an iPhone photo, taken in terrible light. But it really does show the soft, gooey fudgy-ness that is at the bottom of this pie. Truth be told, I wasn’t going to have any of this pie. I’d already had 2 slices of other pies and was about “pie-ed” out on Thanksgiving day. Then my stepmom (who isn’t much of a pie fan) had a bite of my dad’s slice, then another, then she stole the plate right out of his hands and finished off the slice. My dad started raving about it as well…so why not…there’s always room for another pie. I am so glad I stretched and made some extra room for a slice. Perfect smooth and fudgy bottom, with a little crunch from the chopped pecans and a lotta crunch from the whole pecans on top. This might just be the perfect pecan pie. 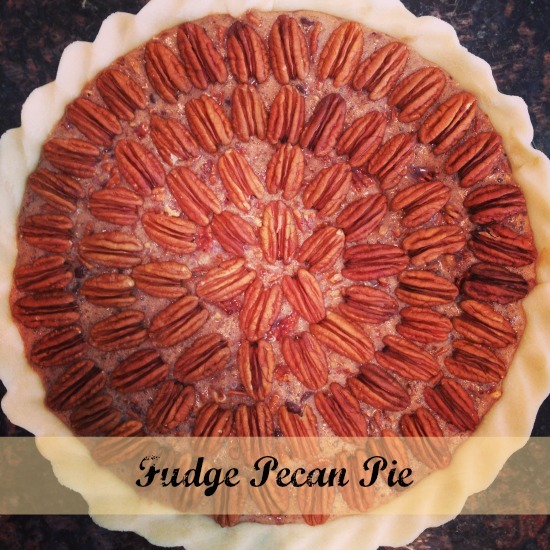 Definitely a pie you need to serve at your next holiday gathering! You will impress your guests or your friends with this one! Preheat to oven to 350. Spray a 9″ pie plate with non-stick cooking spray. Place the pie crust in the base of the pie plate and make a decorative border if you wish. In a large mixing bowl, whisk together the 2 sugars with the molasses, vanilla, salt and eggs. In a small saucepan or skillet, melt the butter and then cook for about 2 minutes over medium heat, or until it begins to brown and turn fragrant. Pour into the sugar mixture and whisk well, then stir in the mini chocolate chips. Chop the pecans if needed and then stir into the mixture. Pour into the prepared pie plate. Top with decorative circles of whole pecans. Bake in the preheated oven for 45 minutes. Then remove the foil piece and cook for another 10 to 15 minutes, or until the middle of the pie has set. 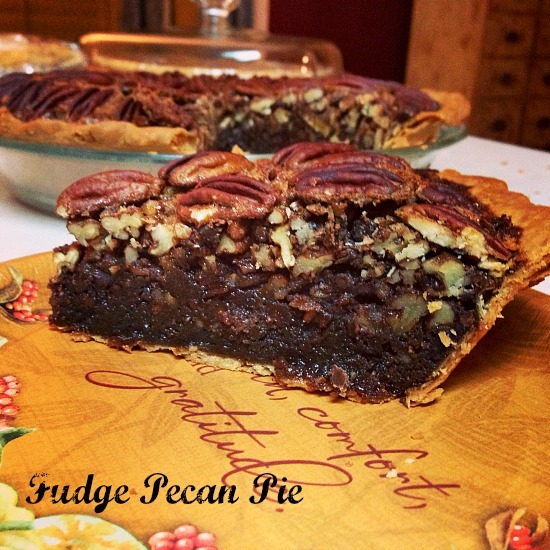 Slice and serve Fudge Pecan Pie. It’s great to see. Oh! If I test it! This site has lots of offer. Great site. Thank You for your site as i love pecan pie and i love chocolate which are both my favorite’s To Cook Or Eat ha ha !! Anyway if you need someone to try your dishes let me know okay I would be happy to be your Official Taster !! When do we use the cream and does your chocolate chips need to be melted before stir them into the mix ? I made this pie last night. It looked great, had the hollow sound when I tapped the top. But when we cut into it the next day the pie had not set properly. It looks like the chocolate chip mini’s didn’t even melt. I’m not sure what I did wrong, but something definitely wasn’t right.